A collection of materials that adorns for special occassions or just everyday. Find a garland in your space today. In our space there is a silver-coloured chain with clips on it. It's in our space the whole year around. It holds birthdaycards, notes, christmascard, valentinecards, summer-holidaycard, etc. Everything we want to keep a while goes on the garland. lovely photos! Garland is a difficult one isn't it? Gosh, well done. I'm really going to struggle with garland. Well thats a good job of it, i never thought of that. Great snap!!! 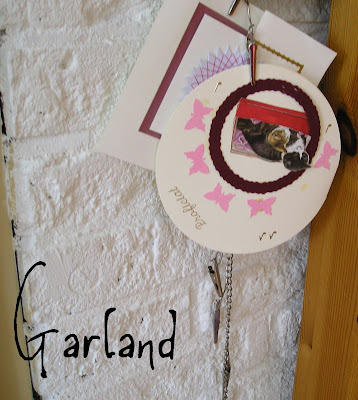 Really neat idea for your garland. Cool! Great idea and fab photo! leuk zeg met die fotos van allerhande onderwerpen!! mocht je zin hebben ik heb je getagged! excellent idea .. well thought of.